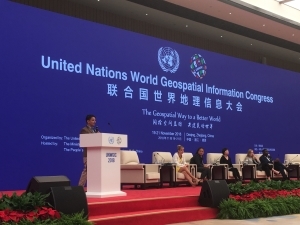 The inagural United Nations World Geospatial Information Congress was initiated by the United Nations Committee of Experts on Global Geospatial Information Management (UN-GGIM), a subsidiary body of United Nations Economic and Social Council (ECOSOC). 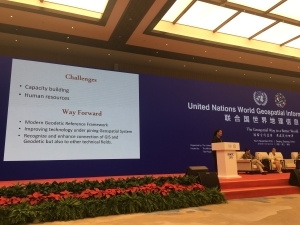 The congress was organised in collaboration with the Government of China through the Ministry of Natural Resources and the Government of Zhejiang Province of China. 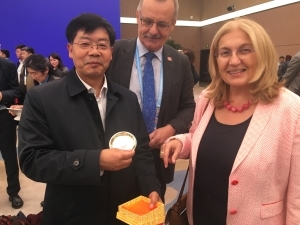 FIG was represented by FIG President Chryssy Potsiou and Incoming President Rudolf Staiger. Further representatives from FIG were Vice President Jixian Zhang, Vice President Mikael Lilje, Focul Group Lead on UN GGIM Subcommittee on Geodesy – Education, Training and Capacity Building (ETCB) working group, Rob Sarib who is chair of FIG Asia-Pacific Regional Capacity Development Network, Eva-Maria Unger, Chair of FIG Young Surveyors. 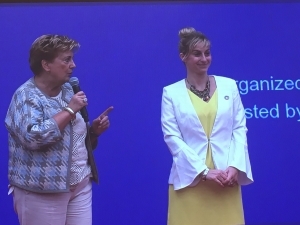 Winnie Shiu, Chair Elect of FIG Commisison 1, and FIG Director Louise Friis-Hansen. Hereto, FIG Young Surveyors had selected four representatives to attend the congress. Around 1400 experts from government, academy, private sector and industry attended of which around 800 international from 108 countries. The congress included 1 Ministerial Dialogue, 4 Plenary Sessions, 35 sessions under 7 Parallel Themes and 4 Special Sessions. Hereto there was an Geospatial Technology and Application Exhibition with around 200 exhibitors. 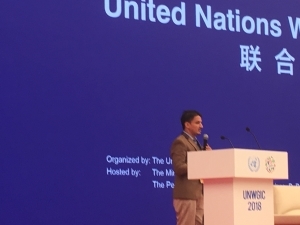 At the closing the Moganshan Declaration on the Geospatial Way to a Better World was presented. 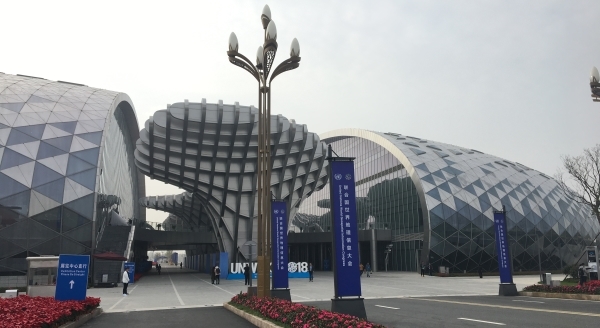 The Congress took place in Deqing, China. 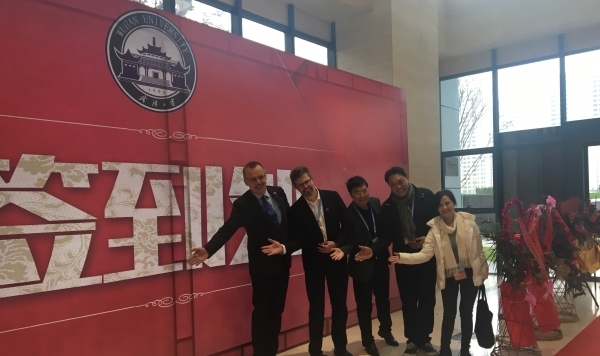 During the congress, FIG delegates obtained a very good opportunity to learn more about China and Deqing. Deqing County is situated at the northern part of Zhejiang Province, right at the core area of the Yangtze River Delta in East China. FIG representatives had a fruitful meeting with FIG Vice President Jixian Zhang together with Han Ni, Beijing iSpatial Co, one of FIG Corporate members, and Han Ni is furthermore representing several companies in FIG, Jingsheng Fan, Vice Secretary-General of China Society of Surveying and Mapping and three Chinese Young Surveyors. 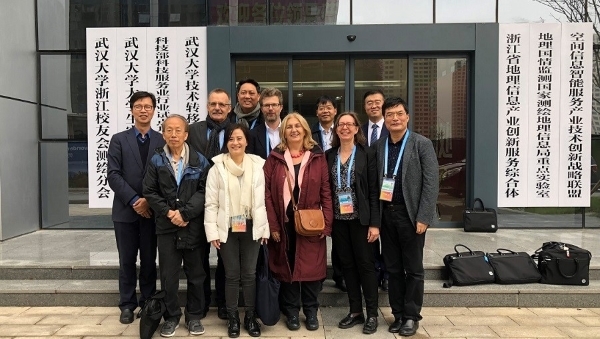 At the meeting the cooperation between FIG and Chinese representatives was discussed. A visit was also paid to the new building of Wuhan University. The Moganshan Mountain, located in the western part of the county, to where a technical tour went, is the national scenic spot and one of China’s four major summer resorts. Listed among China’s 100 top counties, Deqing embraces now a rapid, sustainable and healthy economic and social development. 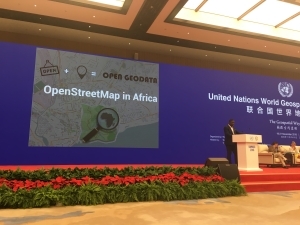 Geospatial Information Park is now one of the most important and leading parts of the county’s burgeoning industries, with more than 250 geospatial information related companies registered and settled down, which has a great momentum for the local digital industry and economy, and approach towards SDGs in Deqing. As one of the key members of FIG, China Society of Surveying and Mapping is the biggest Chinese societies in the industry. Han Ni and Chryssy Potsiou at the office of Han Ni. 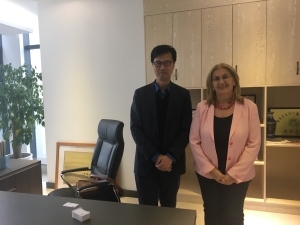 A great thanks to Han Ni for his support and assistance of the visit and his contact to Chinese corporates. 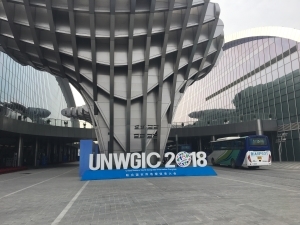 FIG is a representative of UN-GGIM Geospatial Societies (the former JB-GIS). During the Congress FIG President Elect met with some of the other representatives from UN-GGIM GS. 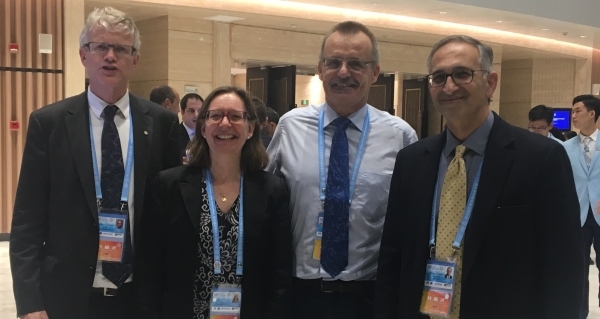 President Professor Menno-Jan Kraak, ICA and current chairperson of UN-GGIM Geospatial Societies, Louise Friis-Hansen, FIG, Rudolf Staiger, FIG President Elect and Abbas Rajabifard, former chairperson. 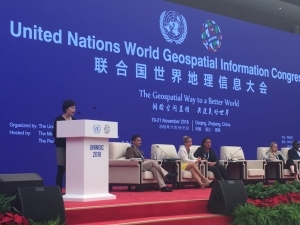 Chair of FIG Young Surveyors Eva-Maria Unger had organised a Young Geospatial Professional Summit. 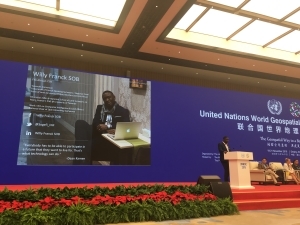 At this summit the four FIG Young Surveyors representatives each gave a presentation about their work as young professionals. 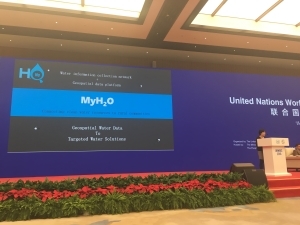 Although it was a big challenge to present at this International event and to a large audience each of the four Young Surveyors did a brilliant and convincing presentation. Congratulations with that extraordinary achievement. 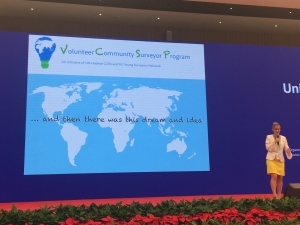 Eva-Maria Unger gave a presentation on the GLTN/FIG Young Surveyors Volunteer Community Surveyor Programme. 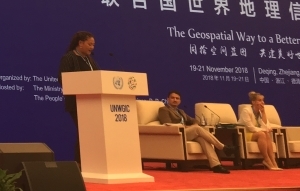 At the closing of UNWGIC Eva-Maria Unger was asked to summarise the Young Geospatial Professional Summit. The FIG Young Surveyors met with Chryssy Potsiou and Rudolf Staiger. Here in front of a model of the new built conference centre. 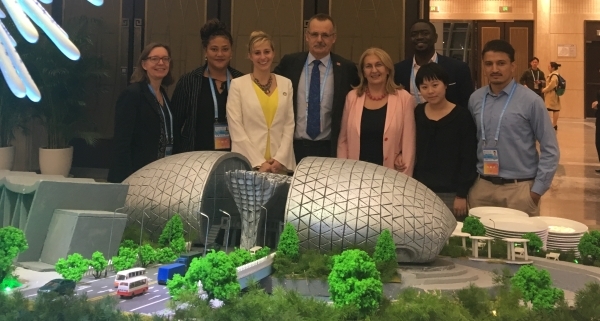 From left: Louise Friis-Hansen, Siotasia Malolo, Tonga, Chair of FIG Young Surveyors Eva-Maria Unger, Rudolf Staiger, Chryssy Potsiou, Willy Franck Sob, Cameroon, Qiqi Yang, China and Uttam Pudasaini, Nepal. Chair of FIG Asia-Pacific Regional Capacity Development Network Rob Sarib also attended the Congress. He was involved in several activities related to the network.